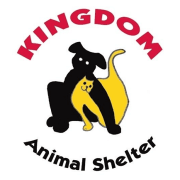 Kingdom Animal Shelter is a limited access, all volunteer, non-profit certified 501(c) (3), animal rescue organization. Our mission is to facilitate the placement of rescued, abandoned, abused or neglected animals in safe, life-long homes. We respect the inherent value of every animal in our care and we strive to prevent overpopulation and cruelty to animals. We envision a time where each animal finds responsible compassionate loving homes where they are free from hunger, fear and loneliness. We envision a time where animal cruelty no longer exists. We envision families and communities enriched by the special bond between humans and animals. We can reduce the overpopulation of homeless animals through education and partnership with community and by promotion of affordable access to spay/neuter services. The animals in our care are our guests and will not be euthanized for lack of space or because their stay with us has exceeded a predefined amount of time. With this clear understanding of our mission and vision for the future our actions are guided by our core values: Stewardship, Respect, Compassion, Community Focused, and Responsibility. Would you recommend Kingdom Animal Shelter?